This blog will feature posts about our Faculty Fellows program by participants in the program. The Faculty Fellows program enables faculty and administrators to intern at organizations in the nation's capital and take the work they do on campus and apply it in a broader context. It’s been a month since my last day in DC. I returned home with just enough time to get myself together for all things Christmas -- from decorations to tree trimming to shopping and wrapping, and finally, the cooking (no time for cards or baking this year). I love Christmas and especially loved seeing so many of my family members over the Holidays. Shortly after the New Year I attended the National Career Directors’ Benchmarking Group meeting. This is one of my favorite professional meetings of each year, as we informally exchange challenges and solutions, and give deep thought to issues impacting career services and higher education in general. This year we were graciously hosted by David Gaston at KU - Rock Chalk Jayhawks! Preparing for this meeting and my presentation about this sabbatical experience enabled me to reflect upon and distill my experience so that it could be shared. My fellowship placement, the Business-Higher Education Forum, is a truly unique organization; their model of strategic business engagement with higher education institutions has resulted in the creation of amazing new undergraduate pathways into high-needs fields, benefitting students and the companies who hire them. BHEF convenes the executives, leverages the job market data, provides the thought leadership, marshals external resources, and provides the consultation and support to all stakeholders to make these initiatives successful. I think a few of my career director colleagues were green with envy, or perhaps it would be better to say inspired…. My contributions to BHEF included consultation on several of their current projects as well as conceptual discussions and writing about future strategic opportunities to create industry-infused campus experiences for undergraduates. I’ve also connected BHEF with NACE (the National Association of Colleges & Employers) to explore opportunities for collaboration and potential joint research projects. My recent doctoral dissertation on campus employment as a high impact practice helped inform several of those strategic conversations. As for the Fellowship piece, our host, Dr. Gregory Weight, President of the Washington Internship Institute, arranged our weekly meetings. We learned about the Georgetown Center on Education & the Workforce, the National Endowment for the Humanities, the Center for American Progress, the Institute of Higher Education Policy, and other higher education entities located in our nation’s capital. We visited with AAC&U, meeting with Bethany Sutton, Tia Brown-McNair, and new president Lynn Pascarella. I found the visits and conversations about the present state and future of higher education invigorating and inspiring, despite the serious challenges we face as an industry and a nation. Lastly, my time away from campus and day-to-day director responsibilities gave me the opportunity to do some significant professional writing. The textbook I co-authored with George S. McClellan and Kristina Creager tentatively titled A Good Job: Campus Employment as a High Impact Practice will be published by Stylus this year. So exciting to produce scholarship that can have impact on graduate students and student employment coordinators! So as I return to Stony Brook University, I am thinking about the amazing opportunity I was given to learn, to write, to consult, and to contribute, all the while being engaged with new people, new organizations, new perspectives, and new ideas. With gratitude to AAC&U, the Washington Internship Institute, my peer Fellows, my colleagues at the Business-Higher Education Forum, and to Stony Brook University for this career-invigorating experience. Marianna Savoca, PhD., Director of the Career Center at Stony Brook University–State University of New York, was a Faculty Fellow fall semester at the Business-Higher Education Forum. To be honest, I expected my next blog to be about another historical event this semester; I thought I would be writing about the election of our first female president. Given the shocking outcome of this bizarre campaign, I guess I will have to settle for the history made by the Chicago Cubs with their first World Series win since 1908 (Yes I am baseball fan). Inasmuch as it was an exciting series with great plays by both teams and a thrilling victory for the Cubs, I still feel compelled to use this blog post to advance women’s causes. Therefore I will spend some time writing about an organization based here in Washington with which I am very proud to affiliate – the American Association of University Women – or AAUW. AAUW’s story began in Boston in 1881 where 17 college educated women, led by Marion Talbot and Ellen Richards, convened to discuss the status and needs of women in college. The first research they published disproved the commonly held belief at that time that attending college adversely affected women’s health. As early as 1907 (that’s 13 years before women had the right to vote), questions were raised about opportunities for college alumnae in the workforce and why they did not receive equal pay for equal work. More than 100 years later, women still do not receive equal pay for equal work. That is one of the reasons why I decided to get involved. I am a trained workshop facilitator for their Start Smart & Work Smart Salary Negotiation for Women programs. Through these amazing programs, women gain the knowledge and practice the skills they need to successfully negotiate salary and benefits, for their first post-college job and throughout their working lives. Living in Washington, DC this semester gave me the perfect opportunity to facilitate a workshop for our Stony Brook University alumnae group here and it was terrific! I also took advantage of my present location to visit AAUW headquarters and meet several of the staff in person. They are passionate, dedicated, and inspiring! At that meeting I pledged to do more for the organization, and have since connected AAUW with my professional association, the National Association of Colleges & Employers, whose 11,000 college and employer members need to know about AAUW and its work. I am also connecting AAUW with the State University of New York (SUNY) system, with 64 campuses and 500,000 students. My goal is to help expand AAUW’s programs by alerting my colleagues in career services across the country and urging them to get trained, to get out there and work with women to help close that pay gap! AAUW is much more than a pay-equity advocate; AAUW is more than 170,000 members strong, with 1000 local branches and 800 university partners. They hold conferences around the country to help develop women leaders, promote and encourage women to run for political office; they work to dispel gender stereotypes and increase the talent pipeline of women in STEM; they engage in research to support advocacy and public policy initiatives related to women and girls; and they provide millions of dollars in scholarships and fellowships to women across the country. I am deeply honored to be part of AAUW’s mission, which remains true to its founding: to advance equity for women and girls. I pray that my small contributions can indeed advance the cause. Marianna Savoca, PhD., Director of the Career Center at Stony Brook University–State University of New York, is a Faculty Fellow this semester at the Business-Higher Education Forum. In my last post I wrote about the historic nature of this presidential election. Today I’m writing about another piece of history made during my time here in Washington. This past September 24th marked the opening of the National Museum of African American History & Culture. This museum was 101 years in the making. For at least two weeks prior to the Opening, local news stations featured stories about every aspect of the Museum, including the long path to its establishment, the selection and perspective of its founding director, Lonnie Bunch III, lengths he and his staff went to identify and procure more than 30,000 artifacts, the testimonials from famous African Americans, the politicians and supporters, the donors, and even the public sentiment surrounding this exciting living testament to the African American experience, their suffering, perseverance, resilience, and successes. In fact the tag line to the museum is: “A People’s Journey. A Nation’s Story.” It is fully both. I was thankful that a colleague at work invited me to join her on a Thursday afternoon. I felt so lucky to have a timed-entry ticket; as of this writing, reserve tickets are completely sold out for the next five months. But if you’re willing to wait, you can get tickets. The story starts in the lowest level of the building. Music prepares you for what you are about to see. You have to take an elevator. As you descend, you watch the years literally roll back in time as the years are painted on the walls in the elevator shaft. The story begins in Africa & Europe in the 1400s. The slavery exhibits were difficult. It is incomprehensible that human beings could be so cruel to other human beings for hundreds of years. And yet, these awful actions are part of our country’s history and need to be acknowledged. But this amazing Museum represents so much more than suffering. It tells the stories of civil rights and the brave activists who risked reputation and personal harm to fight for equality. It tells the stories of African American accomplishments in every field. I was far too young to know then that a girl from my hometown of Brooklyn, NY had run for president in 1972: Congresswoman Shirley Chisholm! And what perfect timing that our first African American president would be part of this historic day, and that he and his family would be represented of course within the Museum’s walls. I could go on and on about this Museum. We were there for 3 hours and were ushered out at closing time with the rest of the public that simply did not want to leave. I highly recommend a visit; I know I will be back myself! Living in our nation’s capital during the thick of the presidential election season has been a unique experience (although many have argued that this particular election has been like no other before it for the obvious reasons). I have been debating with myself about whether I would address politics in one of my blog posts, but given the circumstances of this race and the history that will be made in less than two weeks, I cannot avoid it. I am worried about the future of our country, yet I don’t want to make this blog about my own political views. So I’ve decided to take a birds-eye view of the biggest issues we face today and what the candidates have to say about them. Warnings from prominent leaders about higher education’s dire future are not so new, yet now they are magnified by the presidential election. Take a look at this opinion piece in The Washington Post penned by AAC&U President Lynn Pasquerella where she reminds us of higher education’s mission to educate for democracy. Her piece is a companion piece to this article by Mary Sue Coleman, President of the AAU. It is true. We are at a crossroads. A tipping point. A time like no other in the history of higher education in the United States. The golden years are long gone. Our economic model no longer works. College is no longer affordable. Access to a college education for so many is still limited. Completion rates are poor. The value of a liberal education is questioned in light of the often soft job market for college grads. And yet statistics still present a brighter financial future for college degree holders when compared to those without. So what do our presidential candidates have to say? What are their plans? Their priorities? NASFAA – the National Association of Student Financial Aid Administrators – presents a comparison of the candidates. Note that NAFSAA took Donald Trump’s position from interviews, as his website does not mention a higher education platform (and I doubled-checked: his education positions focus on K-12). Just last week Scott Jaschik, Editor of Inside Higher Education described Trump’s views shared in a recent speech. Hillary Clinton’s plan, The New College Compact, calls for a more affordable college education and calls on states to “halt disinvestment in higher education.” Clearly the Clinton campaign has given serious thought to these issues, and perhaps taken some advice from Bernie Sanders. However, I am still worried. Working for a state-assisted institution where every year we feel squeezed for resources, I worry about how the Clinton plan will be paid for and how states will suddenly reverse their disinvestment trends. Just last week, faculty from 14 institutions in the Pennsylvania state college system went on strike for the first time in system history. According to this article, the State of Pennsylvania funded its higher education system in 2016 at the level it was funded in 1999, 17 years ago: YIKES! Thankfully for the 100,000 students attending these campuses, the two sides came together after 3 days with a tentative deal. Is this strike an omen? Will we see more faculty unrest at public colleges and universities? Or perhaps we'll see more student protests? How will the outcome of this election influence what happens? How will our new leaders in the executive and legislative branches of government work with state, regional, corporate and institutional leaders to make reforms, to innovate, to change the model so that all of our citizens and future citizens will be able to access and complete higher education for the common good? I’m certainly no Nostradamus but I am hoping, praying, and voting, for the best option I think we have. Timing might not be everything, but good timing can certainly be a blessing. I was fortunate to begin work at the National Endowment for the Humanities in September, when the Endowment was celebrating both its fiftieth anniversary and the announcement of 2015 National Humanities Medalists. On September 29, 1965, President Lyndon B. Johnson, signed legislation creating the NEH. This September, the Endowment concluded a year-long commemoration of that anniversary, particularly through Human/Ties: Making Sense of Our World through the Humanities. This four-day forum, hosted by the University of Virginia, included lectures, panel discussions, interviews, film screenings and art exhibits addressing five pressing topics for contemporary American culture: war, race, the environment, citizenship, and technology. Speakers included poet Nikki Giovanni, novelist Junot Diaz, food activist Alice Waters, Russian journalist and activist Masha Gessen, and Hamilton actor Christopher Jackson. My schedule permitted me to attend one day of Human/Ties. One panel addressed the place and frequent absence of racial diversity in publishing and other forms of cultural dissemination. Hearing curator and art historian Sarah Lewis at this panel prompted me to investigate her book The Rise: Creativity, the Gift of Failure, and the Search for Mastery and then to recommend it as a first-year reading at my home institution Hofstra University. Early in another panel with the inspired title “Meet Your New History Teacher, Beyoncé”, popular music historian Karl Hagstrom Miller unpacked the place in American culture of “Alexander’s Ragtime Band,” written by Russian, Jewish immigrant Irving Berlin about an indigenous American musical form and later performed as “roots music” by a white, North Carolina folk musician. In a third panel “Life in the Data Deluge", virtual-reality pioneer Jaron Lanier offered an insider’s critical report on the institutions that are digitizing so many of our daily experiences, as he noted, for example, that facial recognition technology that he worked on failed to recognize black faces, well, because no African Americans were included on the development team. A week after Human/Ties, President Obama awarded the 2016 National Humanities Medal to twelve recipients including chef José Andrés, poet Louise Gluck, and musician Wynton Marsalis. Although the President selected the medalists, the NEH managed the nomination process. In recognition of that work, the Endowment staff was invited to a preview conversation and reception with some of the medalists the day before the White House award ceremony. At that conversation, six medalists answered questions from NEH Chairman William Adams, members of the NEH staff, and some DC college students. Hamilton author Ron Chernow, for example, explained how, without being trained as a historian, he came to write award-winning biographies of American financiers and founding fathers: after struggling as a fiction writer, he found that he could more readily enter into the minds of historical figures than fictional characters. Terry Gross discussed her own circuitous path to excellence as an interviewer, observing with disarming self-deprecation that her own six-week career as a school teacher should cast doubt on the widely held assumption that it’s difficult to fire teachers. Isabel Wilkerson spoke about how her own family participated in the changes she documented, drawing upon more than 1200 interviews, in The Warmth of Other Suns: The Epic Story of America's Great Migration. On its YouTube channel, the Endowment has posted brief videos of 2015 medalists, including religious historian Elaine Pagels and physician Abraham Verghese, addressing the humanities’ place in our wider culture. To sum up, September 2016 was an extraordinary time to be working at the NEH. Craig Rustici, Ph.D., Professor of English at Hofstra University, is a Faculty Fellow this semester at the National Endowment for the Humanities. Founded in 1915 AAC&U, has just celebrated its centennial – 100 years of bringing college leaders together to work on common concerns for higher education, faculty rights, diversity and inclusion, quality, and student learning outcomes. You can read about AAC&U’s history here. But I would like to spend some time on what AAC&U does today. Their tagline is, “A voice and a force for liberal education in the 21st Century.” Today in 2016 with more than 1300 institutional members, national meetings drawing 2000 attendees, topic-based conferences with 400-800, and millions of dollars in grant funded initiatives, AAC&U truly is an influential force! Its most famous initiative, LEAP: Liberal Education & America’s Promise, was launched in 2005 as a call to action for colleges and universities to give critical thought to how they were preparing graduates for the complex civic, economic, environmental, and social challenges of the 21st Century. Since then hundreds of individual institutions have re-examined their curricula and supporting student services, revamped their general education requirements, and reinvigorated their commitments to foundational principles of a liberal education. I’m especially gratified to see a heightened interest in experiential learning, where students have more opportunities to apply their classroom learning to real-world problems, gain industry knowledge, establish professional networks, and develop career readiness competencies. In fact much research has shown that the skills employers want in college graduates align perfectly with the essential learning outcomes of a 21st Century college education. Emerging from the LEAP initiative was Kuh’s work on high impact practices, which I used as the basis for my doctoral dissertation. So you could say that as a scholar I’m very familiar with this work, but with a practitioner’s lens, I have sought to incorporate elements of high-impact practices in the career and experiential programs we coordinate at Stony Brook University. AAC&U research, reports, and meetings have great value, not just for institutional leadership and faculty involved in general education, but for all of us who have made college student success our life mission. My Faculty Fellows placement is with the National Endowment for the Humanities, a federal, grant-making agency. Because the grant review process at the NEH is confidential, I can’t blog about much of what I do there. I can, however, blog about getting there. I thoroughly enjoy my walk to and from the NEH each day. In New York, my commute from Queens to the now debate-famous Hofstra University on Long Island involved a walk, a train ride, and a bus ride, and with all due respect to the West Side Tennis Club in Forest Hills and the Long Island Railroad, the sights don’t compare with what I encounter here in DC. The Faculty Fellows program found an apartment for me on a leafy street of townhouses in the Mount Vernon Square neighborhood near the Convention Center and about a mile and half from the NEH offices in the Constitution Center. My walk to work takes me down Seventh Street past a predictable set of local shops and national chains (Starbucks, Bed, Bath & Beyond, and Dunkin’ Donuts) but also past the Lansburgh Theatre, where the Shakespeare Theatre Company is performing Romeo and Juliet, the National Archives, Indiana Plaza, and the Hirshhorn Museum, one of the Smithsonian’s art galleries. 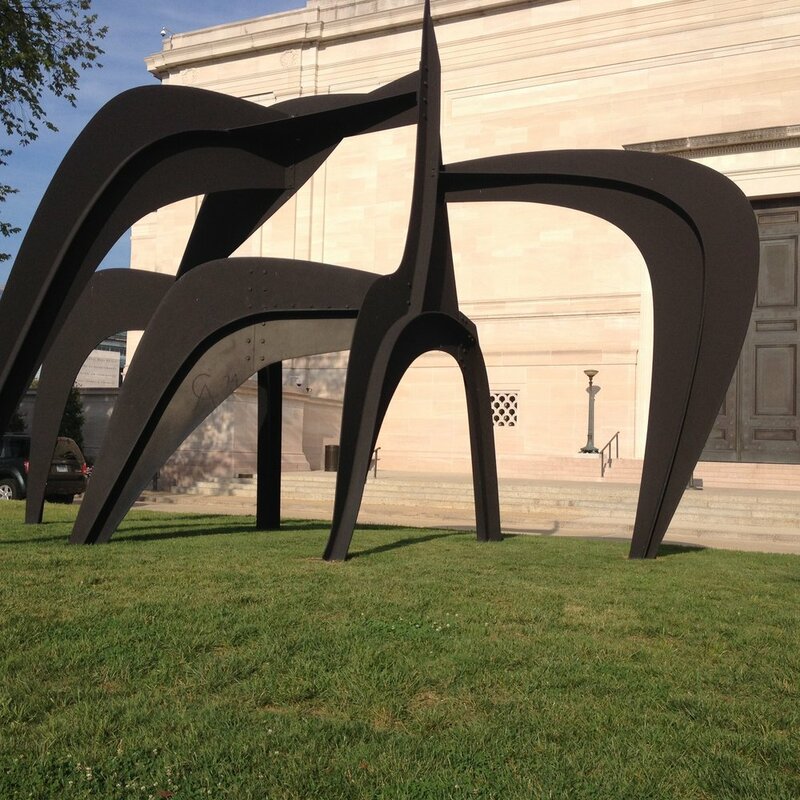 Along the way I pass an array of outdoor sculptures, a nearly two-dimensional figure towering outside the Smithsonian’s Reynolds Center, which houses both the American Art Museum and the National Portrait Gallery; the spider-like sculpture outside the National Gallery of Art; and the Delta Solar outside the Air and Space Museum. 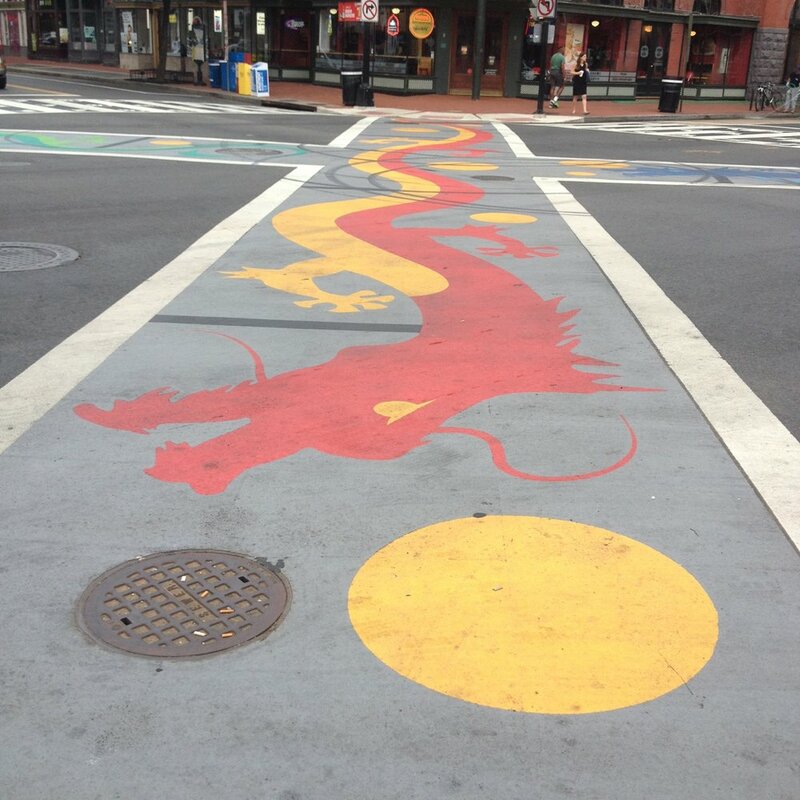 As I pass the entrance to Washington’s Chinatown, I encounter crosswalks decorated with dragons and animals from the Chinese zodiac (rat, ox, rabbit). Once, at that intersection I also saw a compact red street sweeper bearing an uncanny resemblance to the machine the Cat in a Hat used to put Sally’s house back in order in that Seuss classic—it moved on before I could snap a picture. In short, my commute is a gawker’s delight. Last week I had a fabulous opportunity to attend an event hosted by AtlanticLive, the premier event planning arm of The Atlantic magazine. “The Changing Face of Higher Education” was sponsored by the Bill & Melinda Gates and the Lumina Foundations. After a welcome from Margaret Low, President of AtlanticLIVE, and Danette Howard, Chief Strategy Officer and SVP of Lumina, we heard from Congressman John Kline, who told us, among other things in his “View from Washington,” about the bipartisan support to simplify the FAFSA -- how exciting for students and families! A panel of experts included Sarita Brown, President of Excelencia in Education, Cheryl Oldham, VP Education Policy for the US Chamber of Commerce, Scott Ralls, President of Northern Virginia Community College and Michael Sorrell, the President of Paul Quinn College in Dallas, TX. President Sorrell shared his story for how his college has become responsive to the real needs of their students. He described the new urban college model as including servant leadership + entrepreneurship + experiential learning! What an inspiring man! Next, an innovative model from the Universities at Shady Grove in Montgomery County, Maryland was shared. This entity provides an alternate location for coursework for students who are enrolled at nine different universities in Maryland! These students can earn their degrees from their individual universities while “attending” classes close to home. Shady Grove provides a full campus life and even internship opportunities for students from all 9 institutions. Closing remarks were made by Dan Greenstein, Director of Post secondary success at the Gates Foundation. Overall takeaways from this event? Higher education must design models of education delivery that incorporate the realities of today’s college students, who increasingly tend to be adults, work, and have families. We also need to think differently about how we prepare our graduates for the workforce, and be more intentional about helping students make the connections between what they learn in class with the skills and attributes needed by employers (Things we in career development and experiential education have been saying for a long time). It was gratifying to see so many influential leaders coming together around the need for higher education to be more responsive and adapt to make today’s higher education more relevant to and valuable for today’s students. The Business-Higher Education Forum is the nation’s oldest membership organization of Fortune 500 CEOs, college and university presidents, and other leaders dedicated to the creation of a highly skilled workforce. BHEF facilitates strategic engagement between business and higher education institutions to improve alignment between higher education and workforce needs in emerging fields. Through its National Higher Education and Workforce Initiative (HEWI), BHEF has developed market intelligence and labor analyses, mapped skill competencies, and convened educational and corporate partners. The BHEF model of strategic business engagement with higher education moves relationship development from transactional to strategic partnerships. Three notable examples of the transformational projects BHEF has helped to shape include a new academic minor in data analytics at Drake University in Des Moines, Iowa in partnership with the Principal Financial Group, the ACES, Advanced Cybersecurity Experience for Students, Program at the University of Maryland with support from Northrop Grumman, and an academic minor in media engineering at Stevens Institute of Technology with support from NBC Universal. In only my third week here, I’m still learning about all the good work and where my contributions will be. With eyes wide and bags packed, this New Yorker embarked on what is sure to be a grand adventure for me: my first new job in almost 20 years in a city I know little to nothing about. After a champagne send-off from my family in Queens, my husband and I headed south, Google maps with traffic enabled on my cell. In a few hours we arrived at my temporary home, an old brownstone in the Adams Morgan section (AdMo so the locals tell me) of Washington DC. While converted to apartments, the building has not lost its charm; my flat sports lots of character with wood moldings galore, two fireplaces (sadly no longer working), big bay windows offering lots of natural light, and original hardwood floors, knots and all. This corporate rental also comes with washer/dryer, small dishwasher, and two powerful A/C units – especially important since the weather forecast for my first week was accurate: 90s and sweltering. After quickly stashing my things in the apartment, we ventured out on foot. First stop was a few blocks away: the Washington Hilton for tourist pamphlets and the Metro schedule. This hotel is infamously known as the “Hinckley Hilton,” the site of David Hinckley’s assassination attempt of President Reagan in 1981. According to Wikipedia, this hotel is owned by an investment group, one of whose partners is NBA legend Magic Johnson. Sadly for the 10 minutes or so we were inside, we did not run into Magic, Pat Riley, nor any other famed Lakers from that era. We zigged and zagged down tree-lined residential blocks admiring the diverse architecture and small but beautiful front gardens. In less than half an hour we found ourselves at Dupont Circle, so named for Rear Admiral Samuel Frances Dupont of the US Navy during the Civil War Era. A consultation with Wikipedia suggests a bit of a scandal with RA Dupont, which I will not share in this blog as it must first be confirmed through more reliable sources. As our tourist brochure suggested, we stopped at the popular Bar Dupont for a cocktail. And so the adventure has begun! In my first seven days, I’ve walked several miles throughout the NW part of the city, ridden three different bus lines with my new Metrocard, visited with four friends who live in the area, enjoyed meals at five restaurants, and started my Fellowship! My personal goal during this fall semester is to learn as much as I can about the city, and enjoy what Washington DC is and has to offer. Faculty Fellows was started several years ago by the founder of the Washington Internship Institute. Her idea was to offer faculty the same kind of experience we offer students: the chance to gain professional experience in organizations in the nation's capital--an opportunity that really exists nowhere else. This year, I resuscitated the program, as, even before coming on board as President two years ago, I had considered this program one of the most interesting and valuable opportunities available for faculty and administrators. Once admitted to the program, Faculty Fellows intern at an organization I help them find four days out of the week. The other day of the week, we meet to discuss their work, and to meet with professionals working in the higher education field across the city, starting with our partners at the Association of American Colleges and Universities. With us this semester, we have three Fellows who come from different perspectives (though all from the state of New York, somehow) and are doing very different work during their time here. I hope this blog will give you insights into their experience and allow them to share what they have learned and what they hope to bring back to their campuses. For a more detailed description of the program, please visit our Faculty Fellows page.